No reusable bags for this machine in this day and age???? I really like the roomba and that you can use the smart mapping feature, etc. Really big disappointment is you pay 1300 or more for this machine and the automatic bin, but really the bin isn't that big compared to a regular vacuum. Then to top it off, the bags are not reasuable, they want another $20 for 3 more bags and if you have a large house or pets you will go through them fast. The bags all have plastic sections on them that fit in the disposal and so we will be contributing way more to plastic garbage in our environment when all the thing would need is a zipper on one end of the bag to be way more reusable. $150 off valid on Roomba i7+ Vacuuming Robots. Cannot be combined with any other offers. No adjustments for prior purchases. Discount will be applied at checkout. Offer expires at 11:59 PM EST on May 9, 2019. Place robot in your cart. At checkout, select ground shipping and your discount will be applied automatically. Free ground shipping on all robot orders purchased at http://shop.irobot.com. Cannot be combined with any other offer. No adjustments for prior purchases. The Roomba® i7+ Robot Vacuum with Clean Base™ Automatic Dirt Disposal takes convenience to a new level - automatically emptying into an enclosed, disposable bag that holds 30 robot bins, so you don’t have to think about vacuuming for weeks at a time. The premium 3-Stage Cleaning System uses Dual Multi-Surface Rubber Brushes and 10X suction* to clean different floor surfaces throughout your home. The i7+ robot learns, maps and adapts to your home using Imprint™ Smart Mapping technology, letting you control which rooms are cleaned and when. Wherever you are, you can control when, where, and how your robot cleans from the iRobot HOME App for a truly customized clean. Takes care of the cleaning from start to finish. Automatically empties the bin into a disposable bag that holds 30 bins of dirt, dust and hair, so you don’t have to think about vacuuming for weeks at a time. Hey dirt, don’t get too comfortable. Power-Lifting Suction that delivers 10X the air power* for improved pick-up performance. 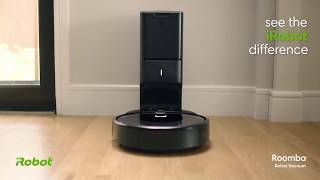 Patented iAdapt® 3.0 Navigation with vSLAM® technology allows the robot to map its surroundings to seamlessly and efficiently clean an entire level of your home. The robot creates visual landmarks to keep track of where it's been and where it has yet to clean. Picks up more pet hair than other robotic vacuums*. Our premium 3-Stage Cleaning System lifts, suctions, and filters to clean the dirt and pet hair you see, and the allergens and dust you don’t. Our High-Efficiency Filter is made from a special material that captures 99% of mold, pollen, dust mite, dog and cat allergens. *Based on proposed IEC fiber pick-up test against Shark, Neato, Ecovacs, iLife, bObsweep. Dual brushes keep constant contact with the floors they love. Each brush is uniquely designed with rubber treads that stay in constant contact with different floor surfaces - from hard floors to carpets - adjusting and flexing, to get everything from small particles like dust and dirt, to hair and large debris. Enjoy hands-free control with Alexa enabled devices and the Google Assistant. Learns your home, remembers your rooms, and adapts to determine the best way to clean with Imprint™ Smart Mapping. Knows your kitchen from your living room-choose which rooms are cleaned and when in the iRobot HOME App. Google Home is a trademark of Google LLC. Alexa functionality available in select languages and markets. Google assistant functionality available in select languages and markets. Q. What is Imprint™ Smart Mapping? A: Smart Mapping technology describes the robot’s ability to learn, map and adapt to your home. Roomba® i7 learns your floorplan as it cleans and remembers this map for future cleaning jobs – this enables the robot to determine the best way to clean based on the orientation of each room, furniture placement, etc. Once the robot has learned your space and you have labeled your rooms, your Smart Map also enables you to clean a room, multiple rooms, or an entire level of your home all from the iRobot HOME App. Q. How does Roomba® i7 build its Smart Map and know your rooms? A. Roomba® i7 builds a map of the area each time it starts a new cleaning job. After cleaning the same space a few times, Roomba® i7 will produce a Smart Map that is pre-segmented into different spaces or rooms. This map can be customized in the iRobot HOME App. You can merge, split and label rooms as you see fit. After that, you can schedule the Roomba® i7 to clean certain rooms at certain times, or have the robot clean an entire level of your home. Q. Can the Roomba® i7 remember more than one floor plan? A. Yes! The Roomba® i7 can remember up to 10 unique floor plans, so you can carry the robot to a different floor or a different home. As long at the robot has mapped the space, it will recognize its location and clean as directed. Q. How often does the Clean Base™ need to be emptied? A. Clean Base™ is designed to hold 30 robot bins of dirt and debris. For some households, this might be one month, for others it could be longer. Results vary based on floor surfaces, whether or not you have pets, etc. Once the bag is full, you will be notified via the iRobot HOME App and you can simply remove it and replace it with a new one. Q. Does the Clean Base™ work with previous Roomba® models? A. No, Clean Base™ Automatic Dirt Disposal only works with a Roomba® i7. Roomba® i7 is equipped with a dust bin that is specially designed for use with the dirt disposal unit. Q: Is the robot bin dishwasher safe? A: No. The washable bin should be rinsed by hand using warm water. Important: Be sure to remove the filter before rinsing the bin. Allow bin to dry completely before reinstalling the filter.